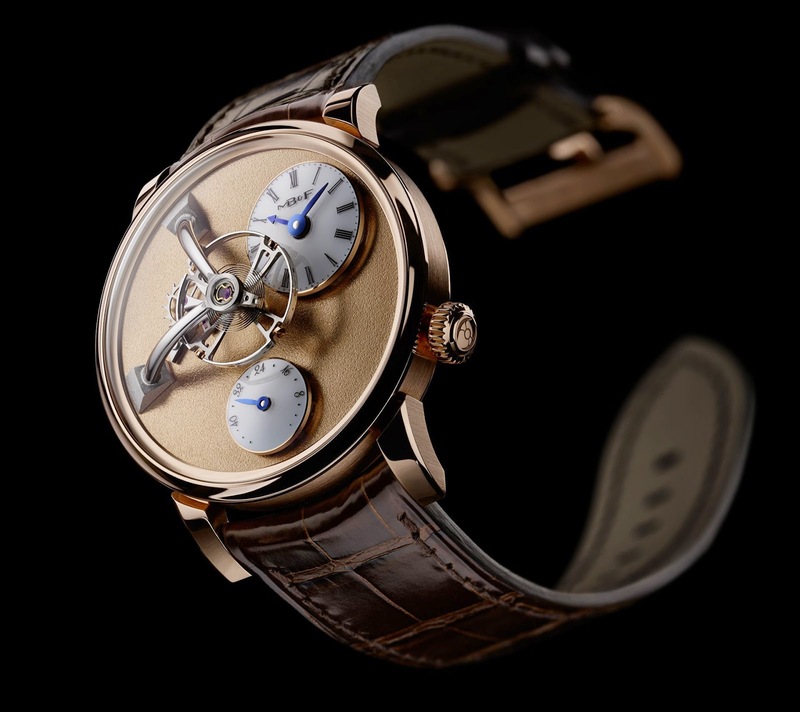 First presented by MB&F in 2014, Legacy Machine 101 embodies and accentuates what is essential in a wristwatch: the balance wheel, which is responsible for regulating precision; how much power remains in the mainspring, which indicates when it needs to be next wound; and of course, the time. With the new ‘Frost’ limited editions, those essential LM101 elements now contrast magnificently against the effervescent backdrop of the frosted gold dial − which paradoxically is not really a dial at all, but the top plate of the movement. Additional contrast is provided by Frost’s highly polished bezel and lugs, which make the matte surface of the frosted dial really pop. Abraham-Louis Breguet is credited with inventing the “frosted” finish (“finitiongrenée” in French) in the late 18th and early 19th centuries. 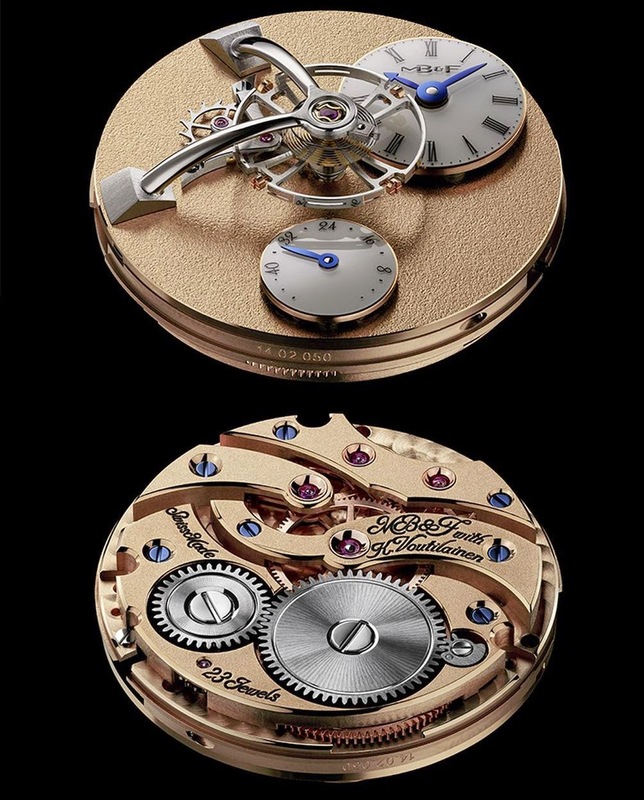 At the time, frosting protected dials and movements from oxidation – more common in Breguet’s day – and added subdued vivacity to movement plates. Traditional frosting methods involved dangerous acids which have been largely replaced by the environmentally (and medically) safer method of carefully compressing the surface with a wire brush. However, this is a much more difficult process to master and obtain a uniform, non-polished surface. Very few artisans today create true frosted finishes: the majority of surfaces that look frosted have in fact been bead blasted, which does not quite have the same visual impact. Visually, LM101 Frost is dominated by the monumental suspended balance wheel, now rhodium plated so that it stands out even more. 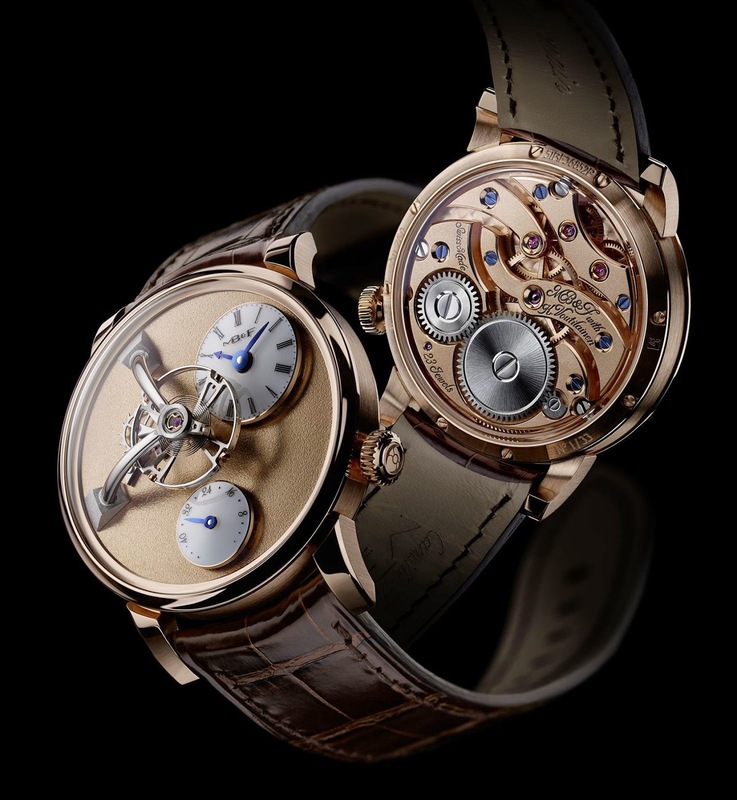 Two pristine-white subdials hover just above the fine frosted movement top plate: contrasting blued-gold hands display hours and minutes at the top right, while the 45-hour power reserve indicator is displayed below. LM101 Frost’s highly domed sapphire crystal is virtually invisible, creating the illusion that you can reach out and touch the prodigious balance wheel hanging mesmerizingly from elegant twin arches. The arches are milled from a solid block of metal requiring hours of hand polishing to achieve its mirror-like lustre. Turning over LM101 Frost, the display back crystal – domed to reduce the thickness of the caseband and, visually, the height of the watch – reveals the exquisitely hand-finished movement. Sensually curved plates and bridges, hand polished bevels, gold chatons and countersunk blued screws pay homage to the style found in historic pocket watches and testify to the respect accorded to historical legitimacy. 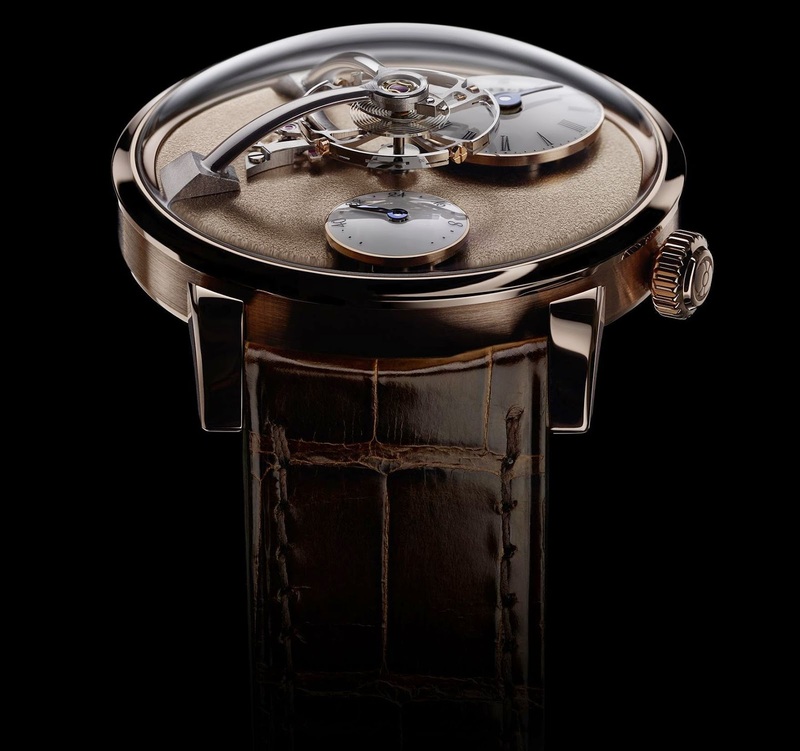 While award-winning independent watchmaker Kari Voutilainen took responsibility for the movement’s fine finishing and fidelity to the horological past, its architecture and construction were developed in-house by MB&F. Legacy Machine 101 Frost is available in two limited editions: 18 pieces in yellow gold and 33 pieces in red gold. 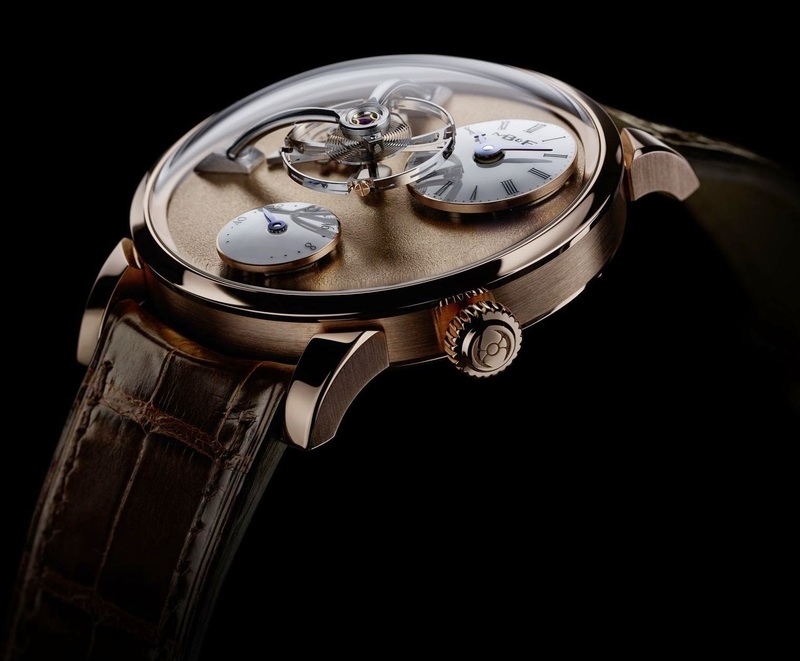 LM101 Frost is a limited edition of 33 pieces in red gold and 18 pieces in yellow gold.